From the very beginning of MLB history, fans have cheered and revered those players capable of consistently hitting the ball into the stands more than all others. While dominant pitchers and spectacular defensive players have more of an impact on a franchise’s winning percentage, it’s the “bottled enthusiasm” of a home run that bursts out to make a whole stadium full of fans jump to their feet in unison and celebrate like they’ve just hit the lottery. Even if your team is down to their last out in the 9th inning, a true fan will stay and root for their favorite slugger to “hit one out of the park” to salvage the game. So it is only natural that the league, its millions of fans worldwide, and the media should care so deeply about home run records, such as the all-time career home run record and the Single-Season Home Run Record. Another thing that makes the Single-Season Home Run Record so enthralling is the fact that it reads like a virtual “Who’s Who” of baseball dignitaries, including many of the legends of baseball who make up the membership of The 500 Home Run Club®. From Babe Ruth, who set and then broke his own Single-Season Home Run Record three times, to Roger Maris (who barely edged out Mickey Mantle in 1961) to Mark McGwire (who battled for the record in consecutive seasons with Ken Griffey, Jr and then Sammy Sosa), to Barry Bonds (who holds the record at 73 and could break it again this year…along with a few other home run marks); 500 Home Run Club members’ personal biographies are forever intertwined with the Single-Season Home Run Record. It all started in 1876, when George Hall of the Philadelphia Athletics hit an unprecedented five (5) baseballs into the stands during a 70-game season. That was quite a feat considering that the string in early baseballs was hand-wound, which made the ball slightly less uniform. Add to that the fact that many batters made their own bats and experimented with bats of all varieties (long, short, flat, heavy) before it was universally determined that bats with rounded barrels seemed to work the best. It was three years before Boston Red Stockings Charley Jones shattered the record with nine (9) home runs in 1879, but he had a slightly longer season (84-game schedule) in which to do so. Harry Stovey of the Philadelphia Athletics cranked out 14 homers during the 1883 season, and Ned Williamson of the Chicago White Stockings upped the ante to 27 long balls in 1884. By the time that the charismatic young Babe Ruth first captured the attention of the sporting world by swatting 29 long balls for the Boston Red Sox in 1919, the season had lengthened to 140 games, but fans across the U.S. were hooked – and the legend of the home run hitter was in full swing. Even with that relatively small quantity, Ruth out-slugged 10 of the other 15 major league clubs combined. The second-highest individual total was 12, by Gavvy Cravath of the Philadelphia Phillies. That year Ruth homered in every park in the league, the first time anyone had achieved that feat. What made it even more amazing was the fact that he was a pitcher by trade, and began to ask to play outfield at times so he could take more swings. 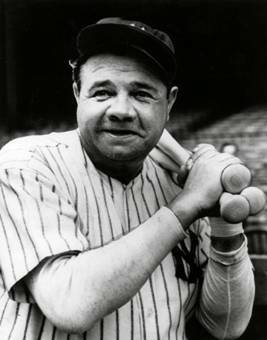 The following season “The Bambino” showed that his manager’s decision to make him an every-day player was a wise move when he hit an astronomic 54 titanic blasts for his new team, the New York Yankees. During his first year with the Bronx Bombers in 1920, Ruth hit just a few more home runs on the road (26) than he had the previous year (20), but he hit far more (29) in the Polo Grounds in New York (where the Yankees played at the time) than he had in Fenway Park (9) in Boston the year before. And, once again, Ruth single-handedly hit more balls into the stands than most other teams combined roster. Of the other 15 major league clubs, only the Philadelphia Phillies exceeded Ruth's total, hitting 64 in their sandbox-sized ballpark Baker Bowl. The second-highest individual total was the St. Louis Browns' George Sisler's 19. Ruth's major-league record slugging percentage (total bases / at bats) of .847 stood for the next 80 years. Over the next few years, George Herman continued to raise the bar by which all future sluggers would be judged by hitting 59 homer runs in 1921 and 60 in 1927. By this time, other powerful batters were beginning to emerge to challenge the legendary Babe for his Single-Season Home Run title, including his 1927 teammate Lou Gehrig, who hit 47 homers that year. But it wasn’t until nearly 34 years later, in 1961, that a tandem of New York Yankees mounted a successful run at and eventually eclipsed Ruth’s Single-Season record. Although he wasn’t nearly as beloved as his teammate, 500 Home Run Club member Mickey Mantle, it was Roger Maris who eventually out-slugged Mantle for the Single-Season Record of 61 dingers in 1961. 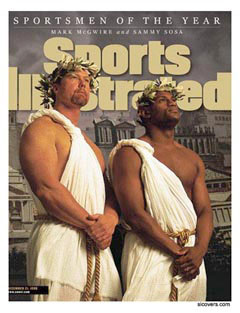 After an epic battle between Mark McGwire and Ken Griffey, Jr., who both got into the 50s in 1997, many expected the two to reenact the Maris/Mantle home run derby of 1961. The player that pushed McGwire more than any other in 1998, however, was fellow 500 HR Club member “Slammin’ Sammy Sosa of the Chicago Cubs. Sosa propelled himself into the race with 20 home runs that May, a single-month record, and would finish with 66 that season. 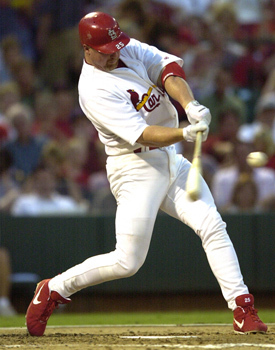 When McGwire hit his 62nd home run to break the record, the Cardinals were playing at home (Busch Stadium in St. Louis) against the Cubs. In a tremendous show of sportsmanship, Sosa, who was playing in the outfield, actually ran in to celebrate with McGwire, who in return honored Sosa by saluting him in Sosa's own trademark fashion. McGwire also went to the stands to honor Maris' family, who were in attendance at the game. The following day, newspapers throughout the United States printed commemorative sports pages in honor of the milestone. The great McGwire/Sosa Home Run Race continued until the very last day of the season, with both player repeatedly tying and then pulling ahead of the other, much to the pleasure of baseball fans worldwide…and the league, which was enjoying a tremendous boost in TV viewership and revenues as a result of baseball’s skyrocketing popularity. A testament to the power of the home run. In the end, the Paul Bunyan-esce St. Louis Cardinal pulled ahead for good in a dazzling display of late-season power, and finished with a seemingly insurmountable Single Season Home Run Record of 70…including many of the longest, most awesome, never-a-doubt home run blasts the games had ever seen. McGwire and Sosa would both better 61 again in 1999, and Sosa would chase Barry Bonds in 2001. In fact, Sosa hit more home runs than the "old" record of 61 three times (66 in 1998 to McGwire's 70, 63 in 1999 to McGwire's 65, and 64 in 2001 to Bond's 73), but he didn't lead the league in home runs in any of those three seasons. The only years he lead the league in home runs were 2000 (50) and 2002 (49). The definitive year of the Single-Season Home Run Record came (to date) was 2001, when Barry Bonds hit a record 73 awe inspiring, jaw dropping, towering home runs for the San Francisco Giants. Each was followed by Bonds signature long stride and supremely confident glide out of the batter’s box as he watched his modern-day baseball masterpieces sail into the stands (as well as out of AT&T Park into McCovey Bay). Far less press surrounded Bonds' chase for the record than surrounded McGwire's for three main reasons: First, most attention was still focused on the recent 9/11 terrorist attacks. Second, the record at that time had stood for only three years. Third, Bonds' poor relationship with the media and some fans contrasted significantly with that of McGwire and Sosa in 1998. Yet Bonds' phenomenal slugging percentage of .863 broke the major league record set by Ruth in 1920. Bonds was initially chased closely by Sammy Sosa of the Cubs and Luis Gonzalez of the Arizona Diamondbacks, but Gonzalez faded late and finished with 57, while Sosa finished closer with 64 to become the first player to exceed 60 home runs in three seasons.